Daniel Major, CEO of GoviEx Uranium, shares his thoughts on operating in Africa and on current uranium supply/demand dynamics. At this year’s Mines and Money Americas conference in Toronto, the Investing News Network had the chance to catch up with Daniel Major, CEO of GoviEx Uranium (TSXV:GXU,OTCQB:GVXXF), who shared his insight on the current supply shortage and demand increase in the uranium market. GoviEx is an Africa-focused uranium explorer and developer that is in the process of transitioning into a producer. The energy explorer believes its choice of mining jurisdictions uniquely positions it to rapidly advance projects, outpacing international competitors. “For the African projects, it’s more about what price do they need to get themselves up and running. What we’re trying to do is bring our cost down to get us in a … US$45 to US$50 range that would allow us to start construction,” Major explained. Being able to quickly advance uranium projects through the exploration, development and production stages will be paramount to meeting increasing demand to fuel green energy grids. Watch the interview above or read the transcript below for more insight from Major, including his outlook on the uranium market in Q4 and into the new year. You can also click here to view our full Mines and Money Americas interview playlist on YouTube. INN: Uranium performed well in Q3. Do you see that trend continuing in Q4 and 2019? DM: Oh absolutely. I think we are at the beginning of a real shift up. I think the key driver has been Cameco’s (TSX:CCO,NYSE:CCJ) decision to close, and Kazatomprom deciding they are now value, not volume. So I think that continual buying by Cameco is going to drive it. They have got to break through some hurdles out there in the market. But with that, I think investors should really be looking at the uranium price and expecting it to go higher. INN: A lot of talk in the uranium space is always focused on Canada and Kazakhstan, [but] you’re an Africa-focused uranium miner. How does mining in African countries compare to Canada and Kazakhstan? DM: Africa has been producing 8 percent, 10 percent of the world’s uranium for a very long time. AREVA started mining in 1971 in Niger, so it’s a long history of [uranium mining]. The deposits are relatively easy. We like Niger, that’s where one of our primary projects is. Why? Because the government is very pragmatic. Sixty percent of their exports every year are uranium, and they have a very strict rule of law. So for us, we like working in Africa. And the other thing as well is some of the biggest takeouts in the last cycle were actually done in Africa. The smallest was $1.2 billion, the largest was $2.4 [billion]. So other countries like the Russian government and the Chinese government, they go looking for projects they can own and produce uranium from. So Africa’s the place to be. INN: Now, GoviEx is on a journey from being a developer to a producer. Can you explain that a little bit to us? DM: In about 2010, we basically found an enormous resource in Niger. At that point we decided that we had to de-risk the project, and the best way to de-risk the project was to turn it into a mine. So we started along that process and we’ve continued to optimize it. We’re working on the data at the moment as well for the project, and that is what we’re in this business for, it’s finding deposits and turning them into mines. So from an investor point of view as well we’re one of the few companies that can get that rerate in this. All uranium companies will go up in value with the uranium price moving, but we’re one of the few that you’ll see go from being a developer to being a producer, and that’s roughly about a two-times multiple straight off in its own right. So it’s a good investment for an investor to look at rather than a company that just stays being an explorer. INN: There’s been a little bit of talk about uranium explorers getting into the vanadium space. Would GoviEx ever consider that? DM: Well, it depends on your deposit. We have molybdenum, and the moly price has been rising as well. So no, you’re driven by the orebody that you’ve got, and we’re not chasing metals just to be in a metal. Our business is to be a uranium producer out of the best uranium projects, and the fact that others decide that they have to chase a different metal because their uranium projects don’t work — then let them do that. INN: You mentioned the Cameco closure as one of the big stories for the year. Are there any other stories that stood out to you in the uranium sector? DM: I think Kazatamprom was obviously another clear view that they’ve changed their general cultural view of how they’re going to operate. I think on the big picture as well, we’re seeing a general acceptance that nuclear is the way to go from an energy point of view, including the WNA, the World Nuclear Association, now being invited into United Nation bodies to help with the energy policy, which in the past, World Bank and IFC bodies would not talk to the nuclear industry. So I think that cultural change has come through, and it’s not going to affect the short term but does show the long term is changing. 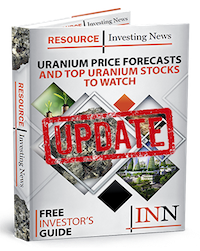 INN: What should investors know about junior uranium companies? DM: That’s a very wide-scoping question. Look, at the end … it is no different to any other commodity sector that you’re looking in, you’ve just got to be looking at whether you want to play the developers, the explorers or the producers. I think the key for us obviously is that if you’re looking at North American stocks, you’ve got to be looking at permitting and permitting risk. And know that you’re not going to be going into production for a very long time — it’s a 10-year process here in Canada. There are some producers that can turn themselves back on again in the US for example. In our case, permitting was six months. For the African projects, it’s more about what price do they need to get themselves up and running. What we’re trying to do is bring our cost down to get us in a sort of US$45 to US$50 range that would allow us to start construction.